Paul Mealor’s music has rapidly entered the repertoire of choirs and singers around the world; his music has been described as having, ‘serene beauty, fastidious craftsmanship and architectural assuredness … Music of deep spiritual searching that always asks questions, offers answers and fills the listener with hope…’. 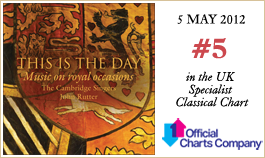 Mealor was catapulted to international attention when 2.5 billion people heard his motet, Ubi caritas, performed at the Royal Wedding Ceremony of His Royal Highness Prince William and Catherine Middleton at Westminster Abbey, 29th April 2011. Mealor studied composition privately from an early age with John Pickard, at the University of York with Nicola LeFanu (1994–2002) and in Copenhagen with Hans Abrahamsen (1998–99). Since 2003 he has taught at the University of Aberdeen, where he is currently Reader in Composition, and has held visiting professorships in composition at institutions in Scandinavia and the United States.